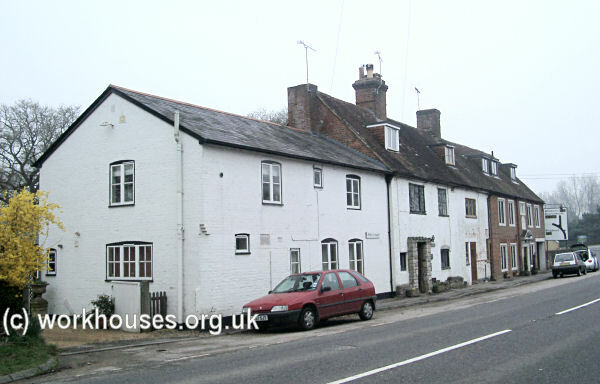 A parish "House of Industry" was built in Ringwood in 1725. It was situated at Ashley, on the road to Verwood. In 1776, it had a capacity of 160 inmates. 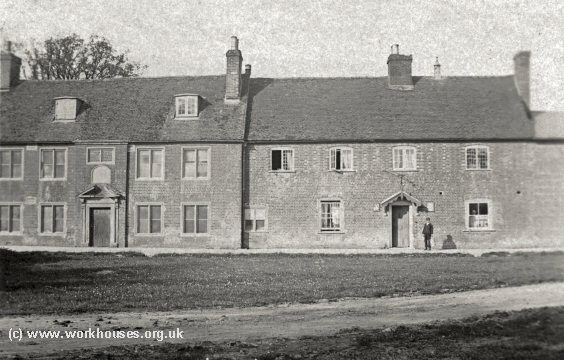 The workhouse building was based on a row of cottages as can be seen in a picture from 1905. Ringwood from the south-west, 1905. 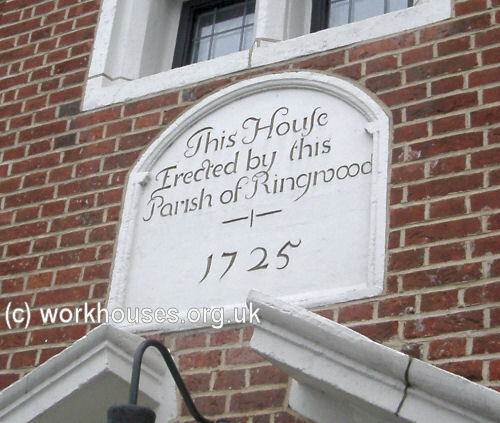 A plaque above the central entrance reads "This House Erected by this Parish of Ringwood. 1725"
Hampshire: Burley (Ville), Ellingham, Harbridge, Ibsley, Ringwood (5). Later Addition: Broomy (from 1868). The population falling within the Union at the 1831 census had been 4,907 — ranging from Ibsley (population 316) to Ringwood itself (3,434). The average annual poor-rate expenditure for the period 1832-35 had been £2,990 or 12s.2d. per head of the population. The newly elected Board of Guardians held their inaugural meeting on 30th July 1835. The minutes of this first meeting note that "Jesse Knolton, a pauper belonging to Minestead, died in Ringwood on Tuesday. Mary Jones, a woman who lived in his family, was begging through the streets for money to pay for his grave, saying the allowance from the parish was a coffin and two shillings to bury him and no more." 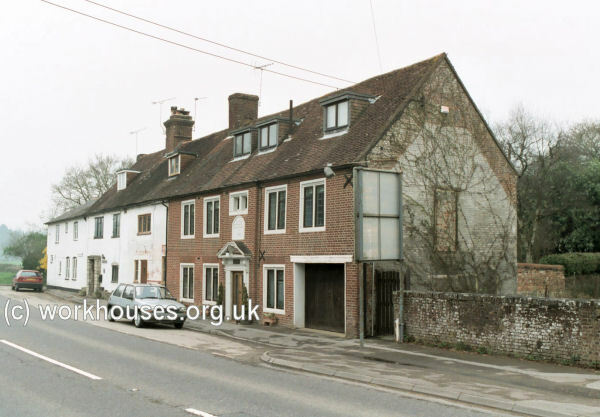 The new Ringwood Union took over the existing parish workhouse. Its location and layout are shown on the 1909 OS map below. The workhouse later became known as Ashley House. It was closed in December 1936. The north-western section of the building survives as private housing. Ringwood from the south, 2003. Ringwood from the west, 2003. 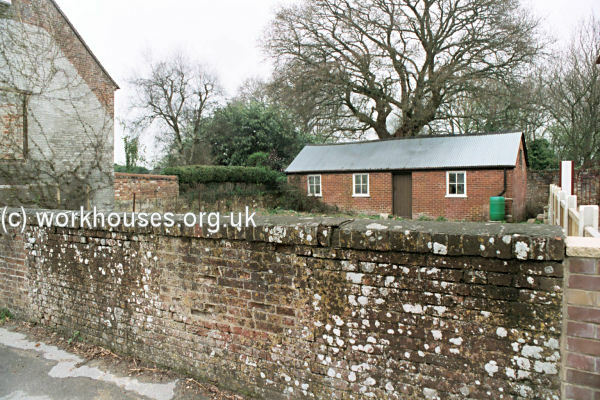 Ringwood outbuilding from the south-west, 2003. Hampshire Record Office, Sussex Street, Winchester SO23 8TH. Virtually the only surviving records are Guardians' minute books (1835-1930).